Energy consumption is expected to be up to 25% lower. The whole sports facility is using 270,000 m³ of gas per year. KE-InJect® system. Outer ring and inner ring. Pool water temperature 29 °C If the water temperature is above the air temperature it will lead to a great deal of evaporation of the pool water. More stable temperature In the old SBV-system the temperature at 1.800 mm above floor level had a variation from 27,5 °C till 30,5 °C during 24 hours. In the new TBV-system the temperature at 1.800 mm above floor level has a variation of less than 0,5 °C during 24 hours. Expected energy savings of 25% By switching over to the new TBV-system the pool is running with only 2/3 of the air volume. Consequently, the consultant expects that Zwembad De Viergang te Pijnacker will save up to 25% on their gas consumption, ie. app. EUR 40.000 per year. Ideal humidity for a swimming pool is 50–60% RH. If the humidity is too high, it is not just uncomfortable for the users (swimmers), but will also damage the building with for instance mold and corrosion. Night savings are not recommended in swimming pools The pool runs with a lower temperature during night time. This results in a higher humidity. Conditions near window We could see that condensation was going to be a problem during winter time. There is app. 5% RH higher humidity at the windows compared to the middle of the room. At -5 °C outside temperature the humidity must be below 60% RH to prevent condensation. Otherwise the windows have to be heated by warm and dry air in a separate heating system. There was a condensation problem in the SBV-system but this is no longer an issue with the new TBV-system. Maarten Uiterwijk, senior counselor installations at Sportfondsen Nederland N.V. In our search for air conditioning plants in swimmingpools which can create an excellent climate and can be operated with less energy, this solution is almost ideal. I am very pleased with the new layout and the co-operation with KE Fibertec. My customer gains numerous benefits from this such as an improved indoor climate and remarkable energy savings of up to 25%. I can only encourage others to explore the many possibilities with Textile Based Ventilation. KE Fibertec AS is market leader in Textile Based Ventilation. We create good indoor climate through our tailored textile ducts for installation in sports arenas, offices, laboratories, schools etc. The system consists of an outer ring where the air volume is on 100% as long as the two inner ducts are functioning between 100% and 0%. This depends on the level of required relative humidity. If lesser air is required, the outer rings will also decrease to a level of 60%. Textile ducts are customizable, easy to install, washable, hygienic, and come in all shapes and colours. 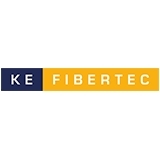 For more information please visit our website: www.ke-fibertec.com.